Rear Setsare an extremely important part of your motorcycle – they connect YOU – THE RIDER to the Motorcycle! A high quality aftermarket rear set should be adjustable to accommodate different heights and foot sizes. It should have smoother shifting action too, no more missed gears. Finally, a great option to have is the ability to set it in standard shift or reversed (MotoGP / WSBK style) shifting. Maximise your potential, tune your machine to your exact requirements. R&G Racing Suzuki Adjustable Rearsets are milled out of lightweight aluminium for high strength and durability. 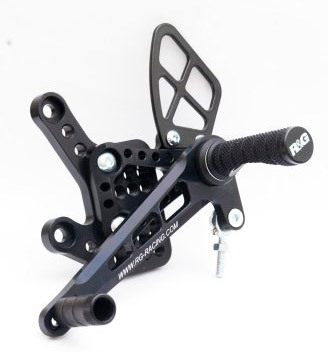 R&G adjustable rearsets provide the option to assemble with racing shift-pattern(1 up – 5 down) or road setup as standard (1 down – 5 up). Our rearsets provide large adjustments and exact positioning to suit every rider (11 positions). Designed to be easily installed. Powdercoated in black with crisp white R&G graphics on the peg and levers, giving these rearsets a very sharp look. The footrests are specially textured to ensure maximum grip in even the most tricky situations. Full fitting kit, including instructions, enclosed.